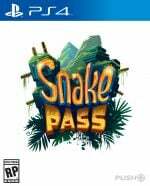 Sumo Digital's sharp-looking serpent simulation Snake Pass will slither to the PlayStation 4 on 28th March in North America and 29th March in Europe. We were lucky enough to get hands-on with the Sheffield studio's scaly foray late last year, and really enjoyed it – it controls really nicely and has a neat challenge to it, as you massage the DualShock 4 to edge your way up poles in order to reach seemingly impossible places. It's a looker, too, and the good news is that it will take full advantage of the PS4 Pro at launch. Those with 4K screens will be able to play the title in Ultra High-Definition, while there'll be improvements for those on 1080p panels as well. In addition, the release will be taking advantage of HDR on all platforms, meaning that the colours in this already very vibrant outing are simply going to come alive. Will you be picking this one up next month? It may prove a nice palette cleanser while you work your way through meatier releases like Horizon: Zero Dawn and Mass Effect Andromeda, perhaps? Ssslide on your ssstomach into the commentsss sssection below and let usss know. On the system its also playable anywhere on. @BLP_Software Well, for as long as the battery lasts anyway. Yeah, if I get this, it'll be on the Switch. In general, if a multiplat that I want releases for all the big platforms, I'll probably get it on the Switch. I like not being tethered to a TV. PS4 is getting enough fantastic exclusives. It won't be neglected at all this year. This and Yooka-Laylee being released next to each other. Feel like a kid again with these two games. If only this game was releasing with a physical copy. Ooh,nice looking snakey platformer jobby..cool. Really glad this has been getting some attention. From what I played, it's going to be a decent platformer, and one that's trying something different with its tactile slithering controls. I'll make some time for this between Zelda and Horizon. Looks like it won't take that long to finish anyway. @get2sammyb If Switch can play this game for 3+ hours then it's probably good enough for bedtime or train trips.. oh and I can play it while my OH is watching stupid TV shows! I don't know why people find an issue with Switch autonomous life - if we want a gaming device to run modern games in HD yet last as long as DS Lites did, welcome back to earth. I particularly roll my eyes at parallels with smartphones often thrown around - their batteries may be impressive on websurfing or Cut the Rope, but good luck making them last 3-4 consecutive hours on a console game port or even on just a graphically beefier title like NFS No Limits. Then again, people complained even about PSP's battery life - I've failed to relate to that for about five years now, despite owning a used copy. So many great platformers this year!